Do you work for Trello? Learning about Trello? We can help. 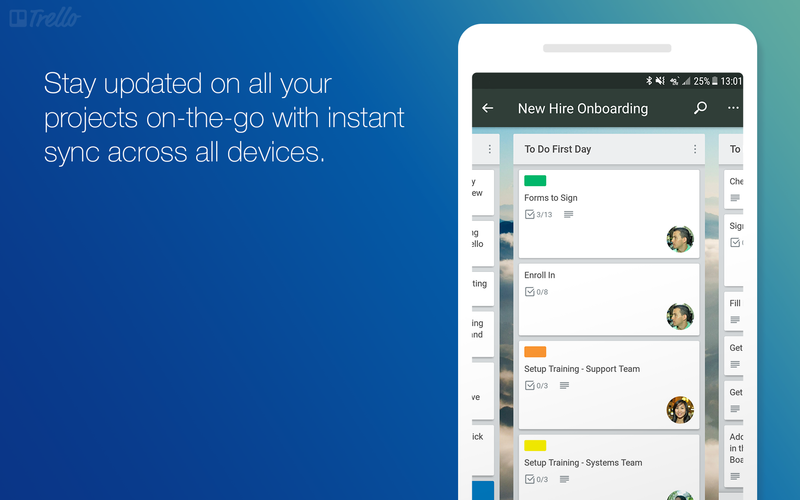 "Trello, a portable board. " The best thing about Trello is that it is a blank board which allows you an extremely correct and concrete organization, the basic organization of Trello is quite simple: boards in which you can create different lists, and within these lists, cards. These cards change their list as they are carried out or pass through different phases. Without a doubt, Trello is excellent in all its work tools, but it does not allow to create repetitive work lists to be able to do "cycles" of tasks. I recomend the Trello application in all its ambits excelete assistant that allows to keep an order in the company and turns out to be very satisfactory with the clients, it has been of great apollo for our employees. Trello has allowed us to solve many problems because it is a board that is based on the organization of the multiple tasks that are presented in my area of ​​work such as marketing and advertising, making the most important tasks have its highest priority to obtain a excellent results with my clients. "Keeps everyone more on task in a pleasant way"
Trello's ability to store all of our project information in a central location that everyone can access is something I really like. We can post and organize our schedules, assignments and deadlines so everyone is clear on what's going on at any given moment and can check in or receive notifications about any updates. The general colorful design makes Trello nice and engaging to work with. Sections are well-spaced and organized, which I think helps me to navigate through various pages and absord information more quickly. For me, working with the more advanced and custom features such as third-party software integrations can be rather complex. It's great that there are resources online to help with the integrations and other configurations, but doing everything in a smooth way can be difficult and take time. 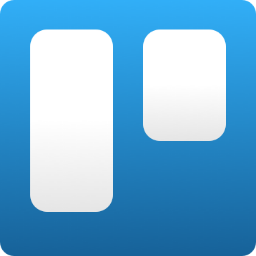 Trello is an excellent colloboration tool I would recommend. It has many intuitive and visual features that make using it quite easy. Trello keeps me locked in and always aware of my colleagues schedules and activities. It's a place I can access the latest team communications and get in touch with my team either through group chats or direct messaging. The Kanban board is such a bold tool that makes all of our task priorities clear. It motivates me to push things through to the next level. As far as business-related results, we've seen great sales and marketing results whenever we use Trello to many projects. "Manage your projects and activities through an interactive board"
Trello is a very good platform to keep the organization of activities and projects as a team, I can create a board where I can assign tasks and activities to my colleagues, I can upload files and it also always keeps me updated with the changes made by each one of the members of my team, I like the way I can organize my calendar, I can also access from any web browser and mobile device and Android. I would like that your add-ons were not so expensive and that they have more wallpapers to choose from, and I can not find a way to prioritize tasks easily. This software lacks some important features to be able to take control of the total project, however, there are many add-ons that can help you. Trello has given a lot of help to my team and me, since it allows us to focus on the most important activities, in addition to keeping my team organized and always aware of all the new changes that may happen in the project. Trello is a task manager and projects highly graphic and simple to use. Trello is downloaded in virtual cards that represent tasks and / or projects, besides calling it virtual cards it is also known as a board or virtual board. These boards are very customizable so it allows you to organize the tasks of a project, add activities to the task, attach files, add tags to tasks, obviously add comments and what is very valuable allows you to share the project with other users and see the changes added. There is a free and premium version of the program, however, the free version offers high advantages that it is not absolutely necessary to have the premium version. Such advantages are in that it is multi-language, it allows a system of online collaborations, it is scalable to the needs of the project, it is understandable by any user, it allows to automate tasks, it is integrated with third-party applications. In summary, Trello is a quite visual project management application where you can have a team of people where everyone can collaborate to reach the same object and complete the project. t is worth trying it not only because it is free but because of the wide range of the program and the great benefits it will give you when planning and following a project. In corporate use it has allowed us to establish, program and achieve projects, it is clear the activities and tasks of each participant of the project and everything is documented visually and in a timeline where you can go back and correct certain points. As one of the many project managers is one of the easy and simple to use without having great knowledge of project planning. "Organize and optimize your tasks like never before"
If you need to define your projects and get all the details available so you work-team can see them, then Trello is your way to go. In Trello you have a digital board where you can create and organize all the tasks that need to be done, and also manage every step of each project using cards and assign them to every member of the team. The use of cards to organize and prioritize tasks, will help to each team member can see it, interact with it, add comments, upload files, links or images and more; so everyone can be on the same track every single time. You aren't able to track completed tasks as there isn't any feature that allows you to do it besides put them in a complete different section or archive those cards away, but if you archive them, then you can't simply see them when you need them. If you have a lot of tasks and, therefore, a lot of cards, and you forget where you put the completed ones, you wouldn't be able to see them again or track them; so this is something that definetly Trello needs to improve to keep optimizing the work. Take your time to learn how all of the features work, becaus even if Trello is intuitive and user-friendly, if you know how everything works you will take fully advantage f this incredible tool. Nowadays you don't necessarily work with your team on the same physical space, sometimes not even in the same country, so having a tool like Trello is helpful to keep tas organized and the team working on the same track. Thanks to Trello, the whole team can work on the tasks and update them in real time, so the projects are being completed in less time, which means more happy clients. Trello will keep your work organized like you never thought it was possible before, and you will love that. Trello was easy to use and didn’t try to have every bell and whistle. It’s a simple tool to help you coordinate tasks with others on your team and keep everyone in the loop on where you are with projects. Not a lot to say here in regards to what I didn’t like. It never gave me any issues for what we were using it for. I would check to see if it can fit your needs however before jumping in with both feet. Overall, I use it every day for work, but something with more features would likely be better. It's just extremely easy to use. It's pretty much the gold standard of Kanban boards. The ability to use multiple boards, set deadlines and assign to people makes this essential for project management when working with a team. This tool is simple to use and I look that it has a browser add-on which makes me see all my to-do lists all the time. It is a neat tool to organize all the projects and tasks on the same page. I like that I can also assign tasks to my colleagues and send them comments when needed. "Trello is my virtual secretary." Since I use trello I am fascinated, it is the best tool for the organization of projects, Tasks, Agendas that organizes my work life and simplifies me to such a level that it gives me time to cover all my projects in an organized way and without the fear of forgetting the tasks that I have assigned for any day. It has very good pro plans that improve the feeling when working and designing tasks and its customization layer is incomparable Trello is the maximum. I think that in the mobile version the creators have not put as much effort as in the desktop version and that makes one is limited to working with trello from the Android so I ask you to improve the mobile version. For the other functions of Trello is really good and simplifies everything at a professional level and your tasks are not overlooked. With trello I can perform several projects and tasks at the same time without losing control of what I do !. Trello allows us to design and organize agendas by date and time, projects and tasks, making our plans and our efficiency at work time a good one And it allows you to work together with other co-workers. Trello is really useful for keeping our teams up to date with what everyone is doing. I think it is a really good tool for teams to coordinate their efforts and improve team cohesiveness. We were looking for a tool that would allow us to better follow along with each others work, and trello has proven to fit the bill perfectly. I think it would be nice if it was more customizable. Also, sometimes people just forget to log in and use it. I think there may be a mobile app version? Our team is looking into it but so far we haven't thought about it too much. We just try to encourage everyone to remind each other to record their activities. Its pretty useful and its free! Everyone knows what everyone else is working on! Being able to keep up with what everyone on the team is up to is really nice, especially since things used to be so scatter brained. We sometimes have to reminds each other to login and update it, but thats not the worst thing. 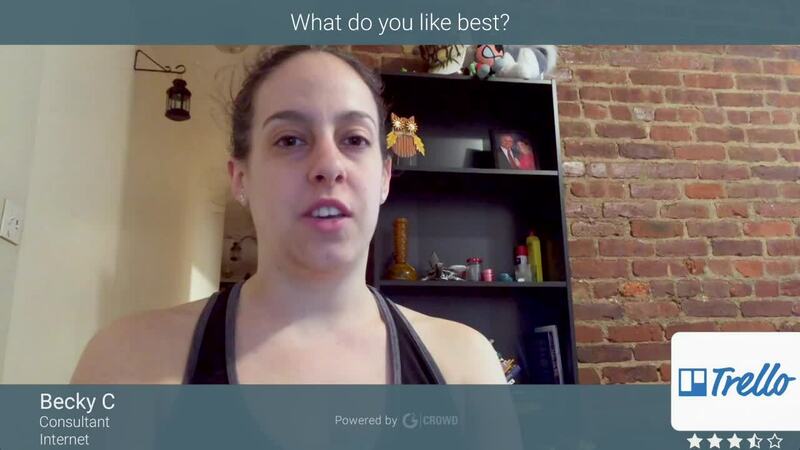 "Simple way to organize your project planning and activities, alone or in a group." Welcome screen with explanations and examples. Varied ways of organizing information. Simultaneous and multiplatform update (Desktop, Tablet, Smartphone ...). Construction and organization of private or group projects (team). Integration with cloud tools. In addition to accepting attachments like jpg, pdf and web links. History of actions. At the moment, I have no bad points to mention, because this tool serves me very well. Trello is a necessary tool for anyone who wants to organize their ideas and projects. There is a free and paid account. Once the user has organized everything, it's easy to manage the information and share it with anyone they want. So: Simple, fast, easy and wherever you are. With the trello, I was able to hold small virtual meetings, where I did not need the displacement of the area coordinators. I saved time, fuel and avoided wear with traffic and greater dynamics, in conjunction with another videoconferencing program. It was a very productive experience. "Great Price and Great Profit"
The cards show very basic information to keep your Trello screen dynamic and easy to see. The simple design and the easy drag-and-drop option to move a card from one column to the next to track the status is very practical. Then, when you click on a card, you get additional information, such as notes, images, documents, etc. You can even write back and forth messages with the person with whom you share the board and they will receive an alert on their device to know they have a new message Trello works really well on computers, tablets and mobile devices. I use it regularly in each one. Trello is excellent in all its work tools. But the only real problem I had is that when the internet is unstable it presents difficulty to work. Instead of having a local caching mechanism, it seems to depend predominantly on the cloud being accessible. Easy to implement and very intuitive. From the first day you can start using it effectively in the organization of projects and tasks.. Managing multiple projects from different sites is very easy and dynamic. Achieving that the time required to control each project is reduced. from the first moment that began to be used in the organization has been of great help. Being able to work it from the first moment. The times for control and monitoring of tasks have been significantly improved. I think Trello runs perfectly well. Great code and never crashes. I use it all day, every day (ok, not all Sundays). It helps me to organize my teamwork perfectly. I use Trello to organize ALL my work stuff. We are a team that needs communication (its a creative team). Trello is real time and very fluid, so we never miss anyone that is talking. It would be awesome to have more things to do if you are in a project alone. I didn't get much from the app trying to do personal work. Overall its nice visual tool for the team to represent what they work on. Trello board is a very useful tool for team to use. Also, its good to use for a personal perspective. This is probably the best thing that has ever shown up in my life as you are able to check what projects you have coming up and really create good structure between what you need to finish to what you have finished. Then you're able to add content like attachments to each and every card and update them with comments to keep your team or yourself up to date. "Trello is indispensable for my work and my personal life"
Trello is a good option to manage tasks in many a group project, although it may be said that it does not provide as many functionalities in terms of agile methods it's still a robust and lightweight option. The clean interface, how customizable a board is and the financial accessibility to small groups. Lastly, Trello is quite lightweight as well. Not many cons, but sometimes maneuvering for the first-time user might be challenging, but easy to pick up, it would be great to have a tutorial and some templates to work with for common project or team management scenarios. Overall is been good, and helpful to assign and make groups goals for the team in general. Very easy to use and assign goals And task between team member. I love Trello and it is an indispensable tool in my work and my personal life I love how flexible, simple, and well organized Trello is. It is quick to teach new hires and contractors to use Trello, and it also has excellent possibilities to extend its application through plugins and add ons. And it is easy to link to everything else I am already using, like Toggl. What I like most about Trello is that I am better at remembering when I can use images that remind me of things and through this application I have that option when organizing all my tasks. It allows me to include images other than a text. This is simply a blank page where you have the freedom to create at your convenience all the things you have to do in a very correct and concrete way. All those who always have so many things to do and sometimes tend to forget them should start using trello in their lives is a great application to organize everything that has to be done in each of your days the truth is the best application in this regard . I am a teacher and I teach both in a university in the afternoon and in the mornings in a primary school and you can imagine the amount of activities that I always have to do. There is always something new to be corrected, exams to do, notes that really place the Teaching is one of the races that you always have more activities to do, so Trello helps me with all this, just a look at the activities that I have written down for the day every morning and that's it. "Good functions at a good price"
Not only has it helped me to organize and have control of an activity of the company, it has also helped me in my family life to create an activity and have everything planned that is going to be well planned. "best tool for project management and development"
Trello is the best tool out there on the market to do all the tasks easily and efficiently, We are using Trello to manage all the works on our app and to get things done by effectively utilizing our developers. The main feature we liked is the drag and drop option such that all the features that we had done can be dragged to completed section and vice versa. Our projects are then marked as per the priority using the feature in Trello which is also so cool. Trello has all the basic feature done is the perfect way they can. Trello so so simple, so all the complex projects cannot be done on this, as there are much limitations. Please add more features like ticketing system. Also it will be very nice if you could add more security like 2FA to the system so that we can ensure more security. Please make the ticketing system so that we can use it for complex projects. We are using Trello to create and update applications, its very easy to manage them on Trello. Also it is more easy to manage Trello on the mobile view. "Trello is excellent tool to manage tasks among team members"
This tool is helping our team to stay organized and focus on the work. Using this tool in our organization, we have streamlined and improved the efficiency in our team. "Quality tool that guarantees success in your project." This software has given me the opportunity to save my work time, it offers me several options that allow me to keep track of all my projects and tasks on a blackboard, lists or cards. I can have an organization of the whole process of my project from its beginning to its culmination and it allows me that the members of my work team can participate in my projects and give their ideas. At first, it took me a little time to understand how to work with this software, but I managed to adapt little by little to be able to understand its functions, I would like to be able to receive notifications of its updates, if they could add the options of different languages ​​it would be great, it only appears in English and users do not always use that language. It is ideal for all types of jobs, trello optimizes the way you work, can organize all kinds of jobs in the office without cost, only with Internet access. It is very practical and fast to keep everything updated, it is a system where you can work on the web and anywhere in the world. "Trello is one of the most complete applications to organize projects and tasks"
If you're looking for a free tool to manage one specific, long-term project Trello is a great resource. In the past, Trello's integration with Slack made the combo of Slack + Trello a must-have for small businesses and startups. Now, even though Slack continues to be a leader for communication and organization. It stops being useful when you have more complex projects. They do have some integrations with project management, code version control software, and others. Nevertheless, in our case, we need to move to a more complete solution for task management. In general, it is very good. Any small team or any small project can leverage Trello. Its user experience is very clean. Every functionality is easy to understand and use. You don´t even need to read a tutorial, guide or documentation to start using it. If you're looking to run a business or organize a team across multiple lines of business, tasks or deadlines, there are a multitude of other project management tools that do it better. A user interface is incredibly simple. You make cards, drag, and drop, then click on them to set details. It's very visual: you can have profile icons with pictures to easily see who's being held accountable for tasks, colors can easily denote different clients or types of projects, etc. Everything is intuitive and a brand new user can be up and running on Trello within a matter of minutes. It's great for being able to see every little detail of a project. We have historical records of everything we've ever done as a software development company and Trello's search algorithm can dig up a ticket from years past in a matter of seconds. As an added bonus, we use the card numbers as ticket numbers for our code commits so we can instantly link the ticket to the code in our repository. There is very little guesswork involved with tracking down a change for us. If we can find the change in the code, we can find it in Trello. If we can find the card on Trello, we can find the change in the code. The text formatting can sometimes be a hassle, especially if you are copying and pasting formatted text into a card. This isn't a huge deal, but it would be nice if instead of doing special characters for certain formatting (you have to remember which characters do what) there was a WYSIWYG editor for every text box. With that improvement, I really don't think Trello would have any competition. Trello has helped keep our team on the same page. Anything we do, we put into a Trello card, then it's in history forever. We can go back and see why a code change was made years ago. It really helps with communication and saves us a lot of time. "The future of the daily billboard"
In search of solutions to mark pending tasks in a project, in listing a series of activities, our department was in need of finding an application located in the cloud. So trello is a fair application to mark project management. Through blackboards where are the lists of concepts or activates to finish and be finished. It is a fairly integrated tool in concept of organization and control by the department. The only error of the tool is that it does not allow you to write down tasks that are performed automatically. or perform tasks by cycles. The rest does not show any failure. The tool has brought several solutions and benefits through its platform to create multiple tasks that are presented in our work environment, because the most important tasks are assigned a high priority in the posters and thus lead to better control and result of the assigned projects. "Trello is part of our team a couple of years ago"
The perfect project management solution if you don't need to summarize/report project activities or track time.nice project management software that is intuitive even for less tech-savvy individuals on the team. Free service is completely functional, and higher tier services are entirely affordable for start-up sized teams. As much as I'd love to continue with Trello, the lack of time tracking and reporting tools is really a deal-breaker. One of our major reasons for careful project tracking is to enable donor reporting. Competitors offer similar services with a major bonus of tools that facilitate accurate and complete reporting. Trello helps keep all of my projects organized and I can share them with teammates so we have a central hub of info. We use in our company since 2016. All teams deliver their activities using trello as an organization board. Many many things. But first of all is that it creates alerts whenever a task is near the delivery date, making you organize yourself better. It's pretty much the famous kanban method where you can use the task format like "backlog", "to do", "doing" to "done". You can enter an unlimited number of cards and members. You can create a myriad of frames for tasks and interleave them. "The most fun way to work"
One of the things I like most about Trello is the ease with which you can manage its interface, just with a few clicks you have many things prepared, simple and friendly. It has a large number of features that make you stand out the organization you want to maintain, in addition to fully maintain your work flow and thus be able to have a higher performance. There is not much to say negative about Trello, but sometimes I feel that it needs to have a little more personalization in order to have a greater identity, in addition to the user feeling completely identified with the tool. If you have a company, Trello is for you. Greater organization, better performance, you can see day by day how your business thrives effectively. Trello has not brought a variety of benefits including a better organization at the company level, also we can share the information between departments quickly. And well, everything related to the workflow, Trello has made a better performance in the organization and I am grateful for that. "Trello organizes the tasks with a very intuitive system." I would recommend as it is a great, user-friendly time management system to help stay organized and on track. I love the different ways to track projects and the options to customize. There are many 'cards' and ways to organize and label based on date, time, subject, etc. It has made tracking our employees projects and time management with ease. Missing features include export, swimlanes, board hierarchies, filterable user-defined fields, and others. Team members are represented by tiny avatars rather than names. Poor granularity of control. The overall system is very intuitive, it's very easy to track the progress of each task. Another advantage of the app is that it is available on multiple platforms: Windows, Mac, IOS, and Android. It is very convenient that Trello can be integrated with other programs like Slack. As far as the pricing goes, the free version includes all the necessary functionality. I use multiple Trello boards mainly for organizing my game development projects and the ability to track my progress has made my life easier and saved up lots of time. The best feature of the Trello is the card system, which helps to easily organize the project by defining top-level task. "Improve the organization of your tasks." Trello is a program that works correctly without problem, fulfilling all that promises, allows quickly and comfortably to have an organization of any project, tasks or any data you need to remember, has multiple options that make this program very interactive , what I like most about this program is its design which is very nice and easy to understand, has a great capacity for personalization when creating any note or project. There is nothing that disgusts me about this program at this time, I would like to add that it would be necessary to include more personalization in the lyrics. Trello is a simple tool, has easy to use tools, has many features that anyone could learn to use without prior knowledge, is a program that has a free service without advertising and contains nothing that could disturb the time of using this program. You can try this program and see if it is what you need. We managed to organize the different projects correctly and efficiently, allows us to organize our different activities in an organized manner, organized a large number of activities in one place without losing control of them and always carrying everything correctly. "The best to handle projects!" There are many positive things to say about Trello, it is extremely easy to use, you have the possibility of scoring notes within a click, you can move them from one list to another without problems, you can attach or include photos, sincerely very versatile and practical. On the other hand it is free, it is completely free of the tedious ads, it is compatible with IOS and android, it is a herramente very complete. There is not much to say about what I do not like about Trello, however I believe that by not managing graphics on the boards, the monitoring of your projects means that you do not have full control of it. And another aspect to take into account is to manage the size of the letters to give a better value and differences the importance of some cards with respect to others. Trello is an easy-to-use tool, you do not need any type of tutorial or a long training to be able to adapt to it, it is practical and sincerely will help you a lot in terms of managing your company's projects. Highly recommended. Trello has brought several benefits to my company on how to better manage my projects and tasks, in addition to better management and organization. And as for the personal thanks to Trello, I can make my day-to-day planning within a few clicks. "I like it, it's very good to organize work tasks"
I use Trello for personal task organizing, at work for tasks and also for recording and sorting out notes too instead of notepad. So easy to organize, drag and drop. I love that it syncs to my phone and any other computer I use. While Trello's card system is very helpful in keeping information organized, it takes a little while to fully understand the system. Trello is, first and foremost, a generic project management tool designed for no specific type of project. It lacks integration capabilities with endeavor specific mechanisms. Trello is such a cool idea. When reading about its functionality, it made so much sense. Its card system is very intuitive and makes sense for managing large projects. On the initial phases of a software development project, Trello has been an incredibly effective solution to setup tasks and distribute them accordingly. Creating a workflow, organizing and assigning tasks, and viewing progress on said tasks are some of the features that make Trello an attractive tool to use when managing projects. Compound all of this with its simplicity and you have an out-of-the-box solution for your team. "Trello has been very useful and easy to understand"
The Software is super cool and fun to use. It can be used in many ways, very creatively. The user interface is very intuitive and super easy to handle. It's awesome that you adjust the layout yourself and create a very personal space. Due to the increased/alternative functionality, the UX isn't as simple. I've found other easier to use softwares than Trello, but I'm not saying Trello was difficult. It just required a bit more of time on my side to get accustomed and to leverage it as I needed it. With that being said, it's probably a better service if you're sharing it amongst multiple users. I do like it - I don't use it too frequently only when I'm planning big or complicated projects that have multiple moving parts. In terms of simple To Do lists or daily tasks, I use other services. I love the board layout - sometimes you want to reference multiple lists at once and on other services you have to constantly flip around - but with Trello it's all on one board in front of you. It's a great layout if you're a spatial thinker and need to see everything at once. "Trello is super simple and organized." I work with multiple projects all the time, and Trello is my go-to tool to keep all my tasks organized. The ease of use of Trello makes it my favorite program for jotting down quick to-dos and ideas. Desktop and mobile apps are very snappy, which makes a pleasant experience when using. A very clean and uncluttered interface means I can clearly see my tasks and never miss anything out. Deleting a card is not straightforward. It needs to be archived first before the option to delete appears. Which leads to finding the archive folder. It's buried deep inside and I took a long while finding it. Super friendly user interfaces. Pro version is very cheap. 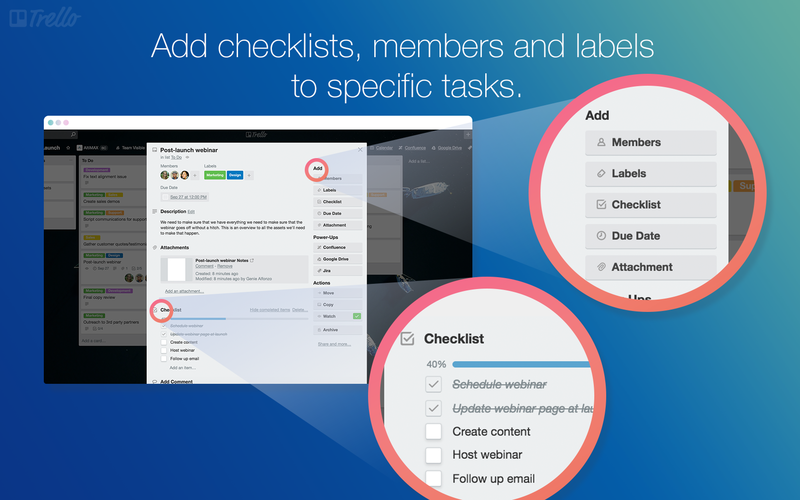 Easy to assign tasks for teams and members. 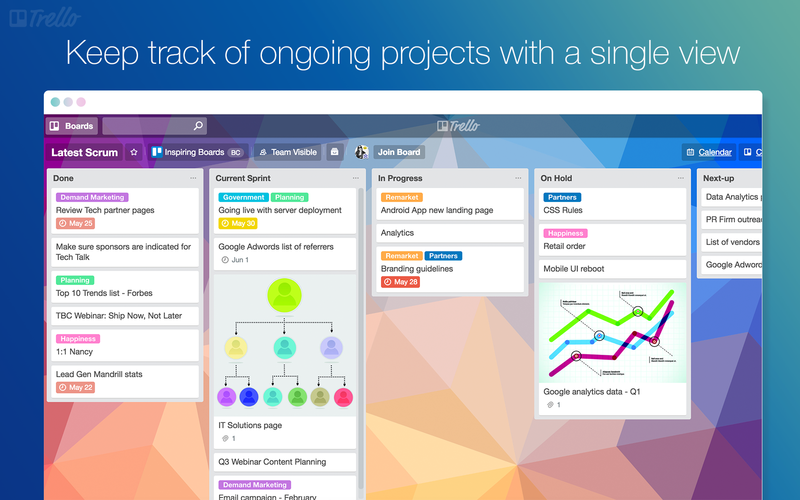 it's super easy to have a complete overview of all your projects and the progress of each task. When you have some projects that involve a lot of moving parts you tend to focus on some tasks and then forget about the small ones. With Trello, I've managed to complete all my projects on a timely manner and with ease. Being able to drag and drop my tasks help me have real-time updates on my project's progress, where my team is at and most importantly, none of the tasks slip my mind since they are all there! "Trello the platform that makes my job fun"
There is nothing wrong with commenting that Trello is a platform with which I like to work because it has different options than the other application that I enjoy in every moment I work. "The best way to organize your tasks and your work team"
Trello is the definitive tool to get your projects defined with all the details that will be needed to get them done. The digital dashboard is simply perfect for creating, prioritizing and, of course, organize actions, and you can manage every phase of the project with cards, and assign them to every team member that is involved with that phase of the project. And this also allows to every team member to interact and get together on the same track, being able to add comments, files, photos or links to each card, so it is just the best way to organize all the work that needs to be done. The only thing that they can improve is to create a system that allows you to track the completed task without the need to put them in a different section or to archive them away. Because sometimes you need the info regarding completed projects, but you can't just see them if you don't know where you put them. So it will be nice if Trello includes an option to view the completed projects exclusively when you need it too. You have to take advantages of every single one of the features that this amazing tool includes, it will make your life easier when organizing and prioritizing tasks, and your team's workflow. Trello has made the project organizing so easy, that the time used to develop each project has been going down through the time, now all the team's members can be on the same page and keep track of everything being done in real time. Being able to get the clients' projects done in less time is a bless, as a client happy brings ten clients more, and you can share some boards with them too so they can also keep a track in what's being done. Trello has made our jobs easy and organized as never before. Personally I've always been using post-it to organize myself both at work and personally but there comes a time when managing so much paper ends up being expensive, besides that they tend to get lost, using Trello I can also organize but virtually and without problems to lose or forget anything since everything is in digital format and linked to my email account. Using Trello you also have the possibility to share your notes with other people, this I have found especially useful for my work since many of the notes that I make can be useful to my colleagues. The Trello service can be used in different platforms, personally I use the application in Windows since I think it works better for my needs. I would like it to be possible to use Trello in other applications that I use in my work as Slack for example (in this case it works), since it is one of the applications that I use daily for my work, it is always grateful to be able to connect applications among themselves. I recommend using Trello to organize not only your work but also your personal life, as for example, the reforms in your home can be perfectly organized using trello and their lists, in this way you do not forget anything and you can share the progress with your relatives. I use Trello to organize myself better in my personal and work life, especially it is useful because it replaces the post-it I used previously to make my annotations, now with Trello you can not only write down all kinds of things but you can organize your projects and simplify your work so that you work more quickly and efficiently than without it. "Key to improve Project Performance"
The best feature of Trello is it is easy to use, flexible and can build effective roadmaps for the product enhancement. It helps in organizing, tracking and forecasting our project deadlines and tasks completion rate. It pretty much ensures the collaborative task management tool for teams. We frequently use the checklist part of Trello to keep track on progress of a card. It fails for high-level management work. It offers only one view type - Kanban. Could be more specific in case of providing the tasks completion and task track in terms of charts or trending graphs. Storage limit is limited to one board. If you are looking to manage tasks more effectively among small teams, Trello is definitely a tool to trust. It helps in removing any communication gap with respect to task assignment, the priority of a task or important notes related to that task. We can label our tasks to decide the priority and can move the tasks from one card to another signifies the development is going on and can maintain the track and time for the tasks among team members. Integration with third party tools can also be done which enhances more understanding between the team members. "Assigning tasks is easy with Trello"
Loved using it and still using it for personal use, but not for business. It is easy to use, I like the extensions for new features. Simple, very visual, works great for small personal projects. Tried it after AgileZen and liked this one more. Stickers and such are nice, but it needs more features for business-grade software. Reports, etc. Better custom field support. Switched to smartQ because of that. Overall, I highly recommend Trello to anyone who wants to be more organized in their weekly to-dos or projects. This tool allows you to create lists for client files, weekly to-dos, projects, and so much more. It's a powerful tool for business owners but would be great for students as well. I started using Trello because we were looking for a way that our Engagement Team could track projects, and assign tasks. Because we have a small budget, we needed something that was free but effective. Within a few days, our team was online and able to track major projects. I enjoyed the simplicity so much that I started using Trello to manage personal/volunteer projects as well. Simple to use, Free Option, Can set up and use in less than an hour, able to share boards with team members to track projects and due dates.